The Pinsk Marshes (Marais de Pinsk) in an 1888 French map by Pierre Foncin. Pinsk Marshes on countries maps. The Pinsk Marshes (Belarusian: Пінскія балоты, Pinskiya baloty), also known as the Pripet Marshes (Belarusian: Прыпяцкія балоты, Prypiackija baloty), the Polesie Marshes, and the Rokitno Marshes, are a vast natural region of wetlands along the forested basin of the Pripyat River and its tributaries from Brest to the west to Mogilev to the northeast and Kiev to the southeast. It is one of the largest wetland areas of Europe. The city of Pinsk is one of the most important in the area. The Pinsk Marshes mostly lie within the Polesian Lowland, hence Polesie Marshes (Woodland Marshes), and occupy most of the southern part of Belarus and the north-west of Ukraine. They cover roughly 104,000 square miles (269,400 km2) surrounding the sandy lowlands of the dense network of rivers and rivulets forming on both sides of the Pripyat River, one of the main tributaries of the Dnieper. Dense woods are interspersed with numerous marshes, moors, ponds and streams extending 300 miles (480 km) west to east and 140 miles (225 km) north to south. The marshes undergo substantial changes in size during the year, with melting snows in springtime and autumn rainfall causing extensive flooding as the river overflows. The Pinsk swamps are home to 827 species of higher plants, of which 18 are listed as endangered in the Red Book of Belarus. For the Pinsk swamps typical alternation of open sedge-reed spaces with almost impenetrable shrub thickets. During the spring flood the swamps are almost completely covered with water, so the local population often has to cross through them in boats. On dry "islands" there are areas deciduous pine forests. The Northern crested newt, a salamander of the marsh of Pripiat. The Pinsk swamps are home to thousands of birds from different biotopes of the Earth (Europe, Asia, Africa, Mediterranean) some of which come to nest here during migrations, and also swamps are a wintering area for many species of migratory birds nesting in northern countries such as Scandinavia, Finland, Baltic countries and Russia. Of the 246 species of birds, which has been observed on this territory 66 species are listed in the Red Book of Belarus. The park nestles a significant number of species that are globally threatened with extinction: Ferruginous duck (Aythya nyroca), White-tailed eagle (Haliaeetus albicilla) (just 2-3 pairs has been observed), Greater spotted eagle (Aquila clanga) (4-6 pairs), Corn crake (Crex crex), Great snipe (Gallinago media). The presence of so many birds of national and international significance underscores the importance of this territory for the conservation of biodiversity of Polesie, Belarus and Europe as a whole. The marshes in a 19th-century painting by Ivan Shishkin. Historically, for most of the year, the marshes were virtually impassable to major military forces, which influenced strategic planning of all military operations in the region. 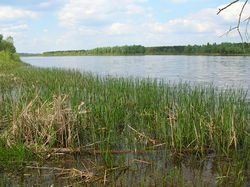 In Volume VII of Wars of Justitian, by the Roman historian Procopius, is a story that the early Slavs hid out from predators in the Pripet Marshes by breathing through reeds. After 1643 Daniel Zwicker was engaged into study of these area known as polish swamps. At the start of World War I, the marshes separated the Austro-Hungarian Fourth Army from the XII corps; the few roads that traversed the region were narrow and largely unimproved. That left a wide gap, and the Third Army Corps of the Imperial Russian Army poured in before the Austro-Hungarian Second Army's transfer from Serbia was complete. The Russians soon captured the valuable railhead at Lemberg (now Lviv), then in the far east of Austria-Hungary (now part of the western Ukraine), as a result. Throughout the rest of the war, the wetlands remained one of the principal geographic obstacles of the Eastern Front. The marshes divided the central and southern theatres of operation during World War II, and they served as a hideout for both Soviet and Polish partisans. At one stage during the war, the German administration planned to drain the marshes, 'cleanse' them of their 'degenerate' inhabitants and repopulate the area with German colonists. Konrad Meyer was the leader in command of the 'Pripet plan'. Hitler scuttled the project late in 1941, as he believed that it might entail Dust Bowl conditions. German racial anthropologist Theodor Poesche had proposed, in the late 19th century, that the Aryan race evolved in the marshes because of the prevalence of albinism. In 1942, after an uprising, approximately 1,000 Jews escaped from the Łachwa Ghetto, of whom about 600 were able to take refuge in the Pinsk Marshes. Known as Pripjet-Sümpfe by the Germans, the wetlands were dreaded by the Wehrmacht troops. During the German invasion of the Soviet Union, the Third Reich armies skirted the wetlands, passing through the north or south of it. However, after the debacle of the Eastern Front in 1944, many retreating units such as the 7th, 35th, 134th and 292nd Infantry Divisions had to cut across the marshy areas. They often needed to build tracks with logs over which they could pull light loads in horse-drawn vehicles. There was a plan to drain the wetlands during 1952, when the area of the marshes was under Soviet administration. In 1986, the region became world-famous because of the Chernobyl disaster; however, the Pripet Marshes should not be confused with the ghost city of Pripyat. That ill-fated community within the Chernobyl Exclusion Zone is located 356 km (221 mi) east-southeast of the geographic center of the Pinsk Marshes area. ^ Blackbourn, David, (2006). The Conquest of Nature: Water, Landscape and the Making of Modern Germany. Jonathan Cape. ^ Karakov, G. (George), 1952 plan for the draining of the Pripet Marshes. New York, N.Y. : Research Program on the U.S.S.R., 1953 (OCoLC)623960881. Chernobyl is a city in the restricted Chernobyl Exclusion Zone situated in the Ivankiv Raion of northern Kyiv Oblast, near Ukraine's border with Belarus. Chernobyl is about 90 kilometres (56 mi) northeast of Kyiv, and approximately 140 kilometres (87 mi) southwest of the Belarusian city of Gomel and 16 km [10 mi] from Ukraine’s border with Belarus. 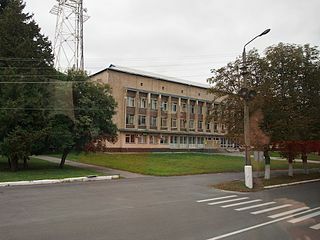 The city was the administrative center of Chernobyl Raion (district) from 1923 until it was disestablished in 1988. Before its evacuation, the city had about 14,000 residents. Brest Region or Brest Oblast or Brest Voblast is one of the regions of Belarus. Its administrative center is Brest. Polesia, Polesie or Polesye is a natural and historical region starting from the farthest edges of Central Europe and into Eastern Europe, stretching from parts of Eastern Poland, touching similarly named Podlasie, straddling the Belarus–Ukraine border and into western Russia. The Pripyat River or Prypiat River is a river in Eastern Europe, approximately 761 km (473 mi) long. It flows east through Ukraine, Belarus, and Ukraine again, draining into the Dnieper. Mazyr - a city in Gomel Region of Belarus on the Pripyat River about 210 kilometres east of Pinsk and 100 kilometres northwest of Chernobyl and is located at approximately 52°03′N 29°15′E. The population is 111,770. The total urban area including Kalinkavichy across the river has a population of 150,000. Mozyr is known as a center of oil refining, machine building, and food processing in Belarus. It is home to one of the largest oil refineries in Belarus, pumping out 18 million metric tons per year. The Druzhba pipeline carries crude oil from Russia splitting in two at Mazyr. One pipeline branch is directed into Poland and the other one to Ukraine. The Riverine Flotilla of the Polish Navy, better known as the Pinsk Flotilla, was the inland branch of the Polish Navy operating on the Vistula river and in the area of the Pinsk Marshes between the Polish–Bolshevik War and World War II. Under Commodore Witold Zajączkowski, it was active in the invasion of Poland and fought against both German and Soviet forces. 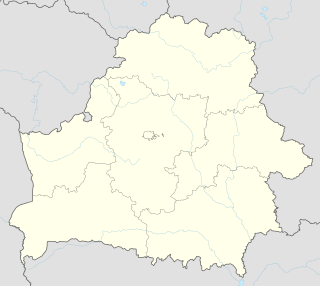 Pietrykaŭ, is a town in Gomel Region, Belarus. It is the administrative seat of Pietrykaŭ District. At the 2009 census, its population was 10,591. 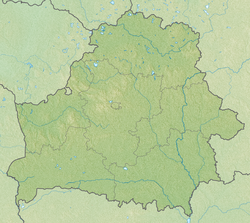 Brahin District or Brahinski Rajon, is a district of Gomel Region, in Belarus. Its administrative seat is the small town of Brahin. 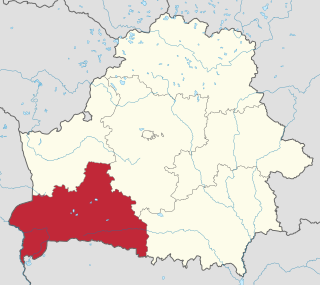 Lyelchytsy District or Lieĺčycki Rajon is a district (raion) of Belarus located in the Gomel Region. Its administrative center is Lieĺčycki. 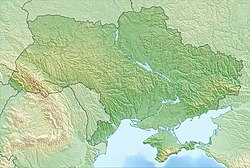 The Belarusian-Ukrainian border is the state border between Belarus and Ukraine with a length of about 1,084 km (674 mi). It starts from the triple junction with Poland to the west and stretches to the triple junction with Russia to the east. The tripoint border at the triple border junction of Belarus, Russia and Ukraine is marked in the form of a monument, while at the other border junction there is a river Western Bug that coincides with the border of Poland. The Pińsk Ghetto was a Nazi ghetto created by Nazi Germany for the confinement of Jews living in the city of Pińsk, Western Belarus. Pińsk, located in eastern Poland, was occupied by the Red Army in 1939 and incorporated into the Byelorussian SSR. The city was captured by the Wehrmacht in Operation Barbarossa in July 1941; it was incorporated into the German Reichskommissariat Ukraine in autumn of 1941. The Polesie State Radioecological Reserve is a radioecological nature reserve in the Polesie region of Belarus, which was created to enclose the territory of Belarus most affected by radioactive fallout from the Chernobyl disaster. Also known as Zapovednik, it adjoins the Chernobyl Exclusion Zone in Ukraine. The environmental monitoring and countermeasure agency, Bellesrad, oversees the food cultivation and forestry in the area. Pripyatsky National Park or Pripyat National Park in a natural reserve in Gomel Region, Belarus. It was founded in 1996 for preservation of natural landscapes around the Pripyat River from which it takes its name. Much of the park's area is occupied by turf swamps. Dzernavichy, also spelled Dzyornavichy or Dyornovichi, is an abandoned Belarusian village in Naroulia District, Gomel Region.